On a ride this past Sunday, I stopped to get a shot of this old oak north of Dover Avenue in North Albany. You won’t get this view for much longer, for the tree is set to come down when the Pheasant Run subdivision is built. On appeal from the planning commission, the Albany City council approved the 147-lot subdivision on May 23. 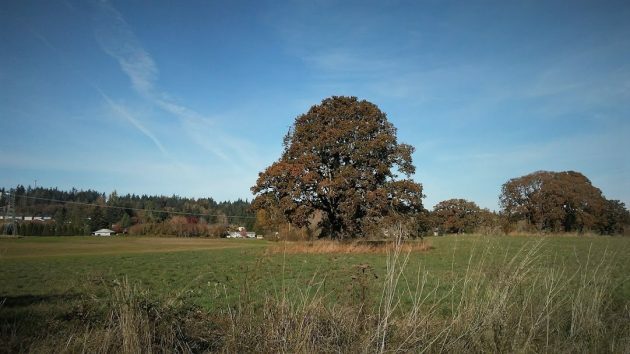 The developer, Hayden Homes of Redmond, agreed to build around and save two of the eight old oaks on what has been a grass-seed field pretty much surrounded by other subdivisions. How long can you still admire the scenery? David Martineau, a planner for the city who was recently promoted to planning manager, told me on Oct. 29 that in his last conversation with the developer, they expect to break ground next spring. This one, off the stub of Essex Avenue, is one of the two oaks to be saved. Mark Twain said, “People are no damned good.” I don’t know on what occasion he said that, but he was right in so many ways. People who cut down ancient oak trees are no damned good. Good news is the next recession will have started by then and many builders will bail on these projects. Either way though, they will come down in the not so distant future, whether it’s next year or ten years from now. I knew that was you on Dover. We drove by you in the Beetle and I remarked to my husband that I thought it was Hasso Hering. My house is one of the three that now face that old oak. It has been much admired over the 15 years we have lived in this house. It was one of the reasons we chose to build in that spot. 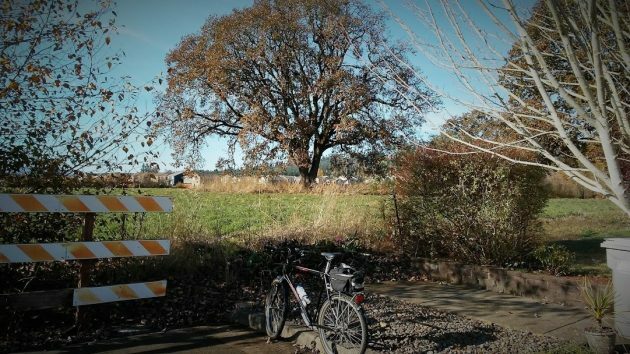 The picture with your bike is right in from of our house. We will miss the trees and the views. Hayden homes representative told us the are hoping to start at the end of next year with this subdivision. Sort of amazing our city is. Not too many years ago a local builder was taken to court by the City for cutting down some non descript oaks In order to build in a business zoning. NOW, the City of Albany feels like it is OK to cut down rare and majestic valley oaks. In what was promised by The City to be maintained as low density rural development. It’s really sad to see the oak trees being cut down. I am thankful I no longer live in North Albany with the aggressive zoning for new housing. It’s kind of fitting that Oak Grove was recently torn down to accommodate for this increase in population. I grew up in North Albany and one of the things I cherished as a child and young adult was that there was wooded areas we could play, experience, and grow. Now, it seems that option is gone and the beauty of the area has disappeared with it. When I recently purchased a house I chose a run down area that was being beautified instead of a beautiful area that is being run down by “bottom dollar” zoning. 190 new homes approved for development in RR & RS-10 zoning of N. Albany with in one year is very much aggressive. I attended two of the aforementioned hearings of which nearly all of the attendees of both were neighbors opposed to developments. However, the Planning Division approved the plans unanimously as if the attendees had not spoken, written letters, or attended. We all felt invisible.